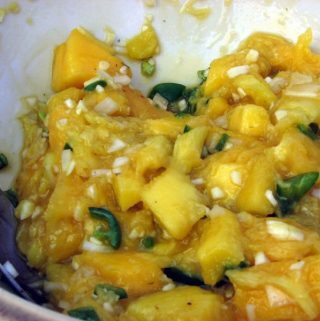 Ataulfo Mango – Tasty, Tasty, Tasty!! Kents are great mangoes. They have almost totally smooth flesh, are very tasty, and are highly recommended IF you know how to eat ’em ripe. To that point, let’s make sure we know what “ripe” means. First, let’s see what a line-up of Kent mangoes looks like. Below we’ve got 8 Kents lined up from the most unripe (Kent 1) on the left to perfectly ripe on the right (Kent 8). Next, let’s take THE SAME eight Kents and flip them over for a different view and perspective on color. Kent 3 looks riper than Kent 4, doesn’t it? It’s got more red. BUT, to the touch, Kent 4 was a fair degree softer, and thus, closer to ripeness. Kent 7 looks ripe, just like Kent 8, doesn’t it? It’s very similar in color to Kent 8. But, alas, cutting Kent 7 open would only disappoint you. Kent 8 is the *only* mango that is ripe. Views 1 -3 below tell the story especially well. See the wrinkles all over Kent 8? It’s ready to eat! Kent 7 is *just beginning* to get a wrinkle or two; it looks ready, but isn’t. Another couple of days, or maybe even one day depending on the environment, would make all the difference for Kent 7. Unfortunately, the web has its limits and can’t deliver a sense of touch. So let me just say this. Kent 8 felt *suspiciously* soft. Using other fruits as a benchmark, Kent 8 would *almost* feel spoiled…or too ripe. 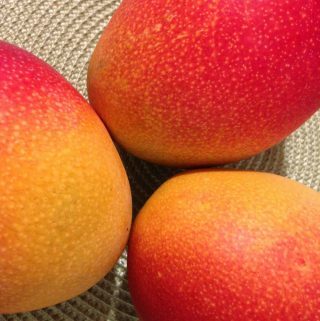 Kents in particular are soft among mango varieties, but ripe mangoes are soft in general, maybe something akin to ripe apricots. So don’t let softness throw you off, especially with Kents. Chances are, a fairly soft Kent with a good amount of wrinkling is a good bet for the real deal mango experience. California Keitt Mangoes – Another Reason Why Coachella is so Damned Cool!